When Nyle DiMarco successfully auditioned for America's Next Top Model (Cycle 22, its final season), he received a flurry of publicity. As one of 14 finalists, he was surrounded by other keenly ambitious contestants, some with several years of professional experience. He told a reporter that he expected to be eliminated early on. But he ended up winning the competition. He was the first Deaf contestant and winner. The ANTM finale aired on December 4, 2015, with DiMarco beating out Mamé Adjei. By that time, he had become a headliner—the best-known "newcomer" personality in the Deaf community, his renown approaching or equaling Marlee Matlin's. There was widespread rejoicing in the Deaf community. Shortly afterwards, DiMarco signed with Wilhemina Models in New York City. On March 8, 2016, it was announced that DiMarco would be competing on Season 22 of Dancing With the Stars. He would partner with troupe member Peta Murgatroyd for nine of the ten weeks of the competition. DiMarco, who had no experience in dance, began the demanding process of rehearsals in Los Angeles, training to become a professional-caliber dancer. He went about it with determination and exuberance. DWTS kicked off on March 21. Historical note: Matlin was DWTS's first Deaf competitor, in its 6th season (2008). She partnered with professional dancer Fabian Sanchez. They were eliminated in the sixth week. DiMarco's advocacy, is an outgrowth of his experiences growing up as a fourth-generation Deaf person with no language barriers in his family, and a proud Maryland School and Gallaudet University alumnus. He partnered with Language Equality and Acquisition for Deaf Kids (LEAD-K), and on April 11, announced the formation of the Nyle DiMarco Foundation, to combat language deprivation among Deaf children, provide resources for parents, and promote ASL/English bilingualism. After DiMarco made comments to a Washington Post reporter about the severity of language deprivation among deaf children, AGBell's president, Meredith Sugar, saw fit to publish what amounted to an attack on him, ASL, and the Deaf Community. The Deaf Community responded with an outpouring of vlogs, messages, E-mails, Facebook posts, and letters expressing their anger, with several demanding Sugar's resignation. She responded to the firestorm in typical fashion: she refused to address any of the issues raised by the protesters, and issed another hypocritical statement calling for "respectful opem discussion"—and this after ignoring the Gallaudet Student Body Government's request for a meeting with AGBell leaders. The Deaf Community consensus was that Sugar owed DiMarco an apology. None has been forthcoming (not that we're surprised), but DiMarco continued, undaunted, on his path, and the Deaf Community has been organizing, mobilizing, and discussing what actions to take. Getting back to the dancing, it took a little while for Nyle and Peta to meld as a team, but once they did, they were dynamite. 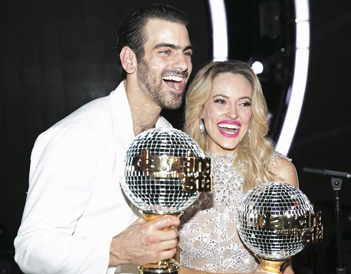 Nyle kept pace through the vibrations, Peta learned how to incorporate visual and tactile cues, so that their moves were perfectly synchronized. It was an adventure for both of them. Nyle's confidence and grace wowed us. Powerful stuff. He and Peta were a fabulous, successful team. The finale was broadcast on May 24, and it was a rare Deafie who wasn't visually glued to the screen. They did their final dance, an emotional freestyle, to Disturbed's "The Sound of Silence,” the Simon and Garfunkel classic about the inability or refusal of people to communicate with each other. During the last few moments, the music was turned off so that Nyle and Peta were dancing in silence, enabling the audience to understand a bit of how it felt to dance without sound. They got a perfect score of 30. DiMarco won first place, beating out mixed-martial-arts fighter Paige VanZant (a very fine runner-up, too), taking the coveted mirrored-ball trophy. Cameras showed his mother, Donna DiMarco, in the audience, both mother and son elated, brushing away tears of joy. The Deaf community was, without exception, elated. Congratulatory vlogs, posts, messages, flying hands everywhere. We were wowed, we were proud. Deaf advocate-artist David Call made the witty comment, "It's raining flaming pianos on Volta Bureau building in Washington DC right now!!!" Oral-deaf AGBell Board member-blogger Lisa Goldstein, who has made disparaging comments about other Deaf competitors on reality shows, posted an essay in the opinion forum The Establishment, titled "Nyle DiMarco's Activism is Dangerous for the Deaf Community," disparaging his advocacy and making incredible comments such as this one: "Would your reaction change if you knew that Nyle could have heard the music if he wanted to? He has said he never wanted to hear, so he chooses not to wear hearing aids. That’s his prerogative—he’s opting to live in silence, which is something many people may not realize." And this: "Deaf Culture extremists will respond to this essay in full force; they’re well-known for their intimidation and manipulation tactics." And "Yet, despite him saying he wants to use his celebrity for good, he’s dividing instead of bridging." Dividing? DiMarco has done much to focus global attention on the Deaf community and sign language, and in a positive way. We suggested that a more honest title for Goldstein's essay would be "Nyle DiMarco's Activism is Dangerous for AGBell." Goldstein's essay provoked another firestorm of fury, and a counter-punch, three moving essays, also posted on The Establishment, under the title "Why Nyle DiMarco's Work is Crucial for the Deaf Community": Dawnena Muth's "Nyle DiMarco's Platform is Helping the Silent Minority be Heard," Morgan Leahy's "Nyle DiMarco’s Accomplishments are Helping to Bridge the Deaf and Hearing Worlds," and Alex Lu's "Nyle DiMarco Challenges My Internalized Audism and Inspires Hope for the Future." The Deaf Community's battle with audism continues. discussions (and arguments) can be found on The Establishment's Facebook page. And DiMarco continues to use his celebrity to spotlight the Deaf community, ASL, and the importance of early access to visual language. And, for DiMarco, yes, there does seem to be something lucky about 22.